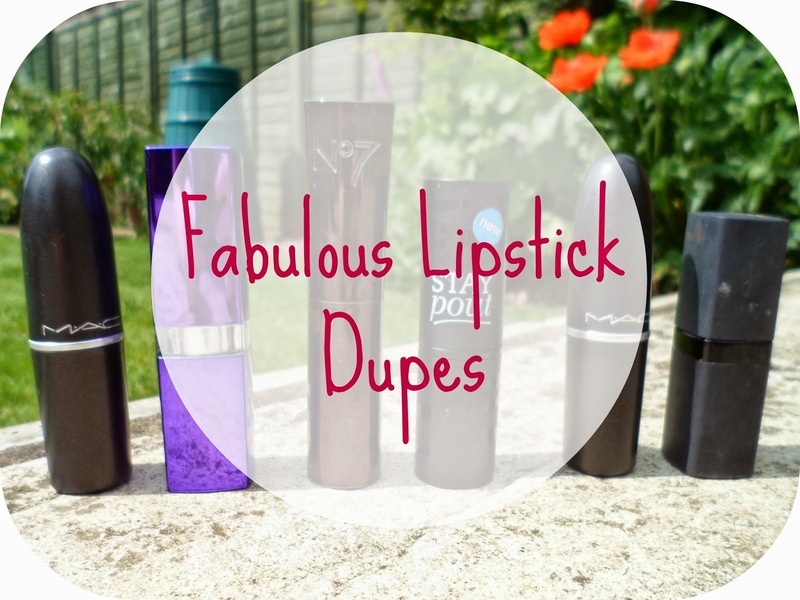 I love a good dupe when it comes to make-up, but then again who doesn't?! Knowing that you can get nearly the same fab product but for a fraction of the product's price tag is one good feeling! I'm always reading and looking out for other bloggers dupe posts so I thought it was about time that I started sharing with you guys dupe that's I have discovered over the last few years! First up is three lipsticks that I seem to have copycats of - I love higher end and drugstore lipsticks just as much as each other... just FYI! If you've read my blog before you may know that Girl About Town is my favourite Mac lipstick that I own! I am such a fuchsia lover and it's always a go-to shade for me! It wasn't until recently that I noticed stumbled across this lipstick by Rimmel in my collection and saw how similar they are! 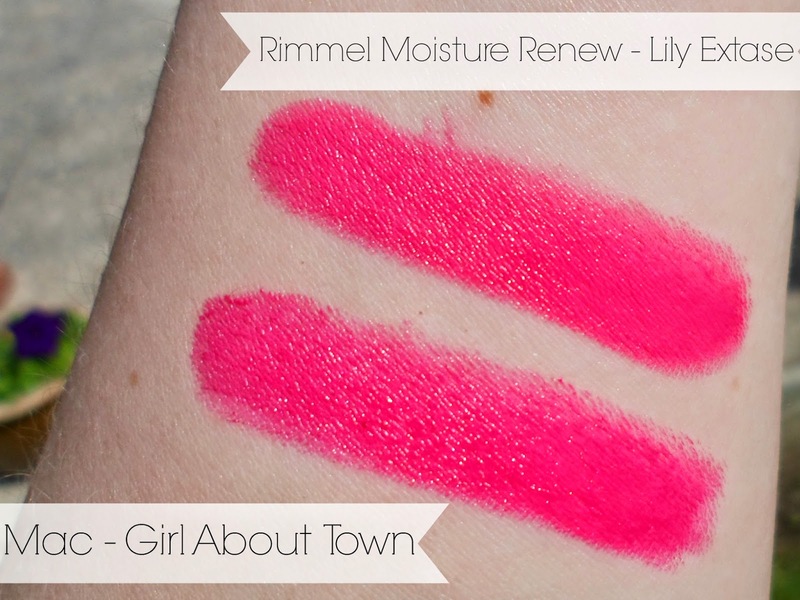 I know that the Moisture Renew lipsticks have had a bit of a make-over recently so I'm not sure if this shade is still available but if you can get your hands on it I highly recommend you do! They are both super hydrating, pigmented and have a great long-lasting finish. These are both Boots brands and I think most people see Seventeen as the "younger, hipper" version of the formal No7. Even the name of the products are similar, the only main difference being the price! The Seventeen lipstick is less than half the price of the No7 and for me the quality is totally equal! 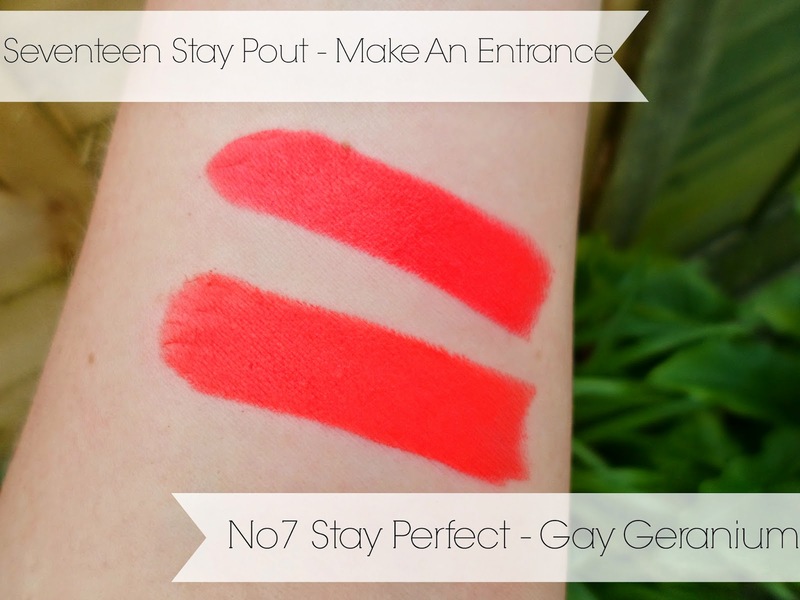 The colours of both are stunning and so stand out, although the Stay Pout is only very slightly darker than the Stay Perfect! This is probably the best dupe I've found so far! I have been buying Barry M lipsticks and glosses for years and really do swear by them! The colours are amazing and they are still some of the cheapest on the drugstore market! Of course I LOVE my Mac lipstick but if you aren't up for paying the price of mac or just wanted to see weather a colour this vibrant would suit you before splashing out the Barry M alternative is totally and utterly perfect! So there's 3 fab dupes for you all - let me know weather you like this type of post and if you would like to see anymore! These are great dupes! I wish we had more of these brands available in the US! These are great, thank you! I'm definitely going to start going to Barry M for lipsticks now, as I love Rimmel Kate Moss but really only want to be using cruelty free products, so will deffo be buying their lip paints now! 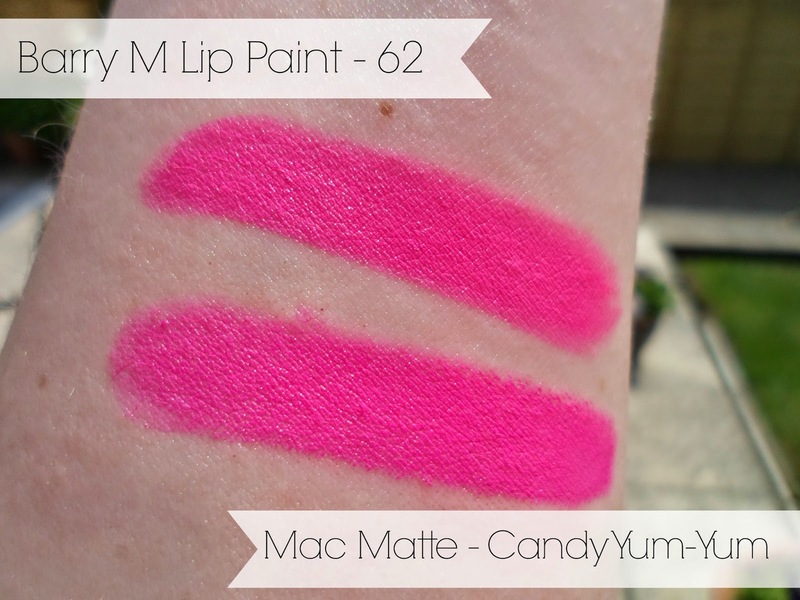 These dupes are so close to the colour of the mac lipsticks yet so much cheaper! Wow these are amazing dupes, well done!! Wow, No7 Gay Geranium looks INSANE! I've been looking for a replacement for 17 Hot Chilli which appears to have been discontinued, I think Make An Entrancement might be it! Such a great post! I really want to try out the Barry M lipstick and that shade is gorgeous!